Home / Vacancy / Vacancy Announcement from Reliable Nepal Life Insurance Ltd. 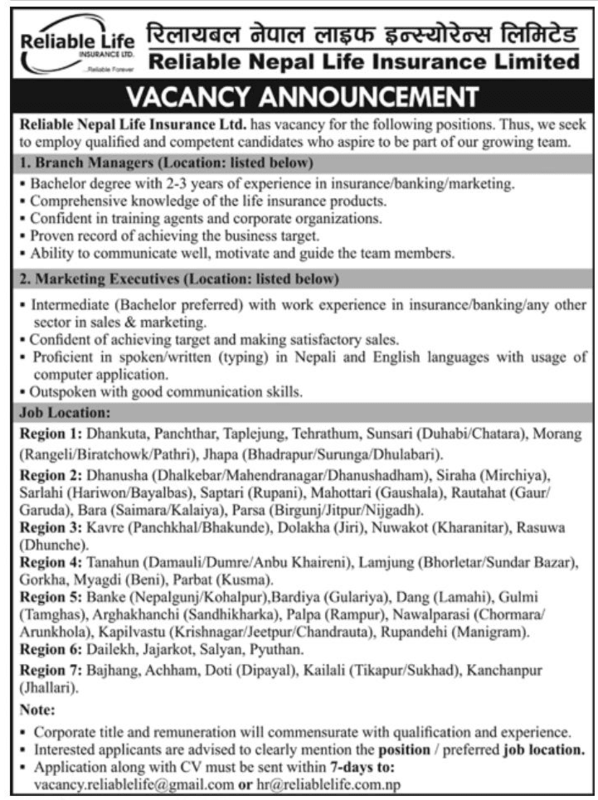 Vacancy Announcement from Reliable Nepal Life Insurance Ltd. Reliable Nepal Life Insurance Ltd. following positions. Thus, we seek to employ qualified and competent candidates who aspire to be part of our growing team. Bachelor degree with 2-3 years of experience in insurance/banking/marketing. Ability to communicate well, motivate and guide the team members. Intermediate (Bachelor preferred) with work experience in insurance/banking/any other sector in sales & marketing. Confident of achieving target and making satisfactory sales. Proficient in spoken/written (typing) in Nepali and English languages with usage of computer application. Outspoken with good communication skills. Region 1: Dhankuta, Panchthar, taplejung, Tehrathum, Sunsari (Duhabi/Chatara), Morang (Rangeli/Biratchowk/Pathri), Jhapa (Bhadrapur/Surunga/Dhulabari). Region 2: Dhanusha (Dhalkebar/Mahendranagar/Dhanushadham), Siraha (Mirchiya), Sarlahi (Hariwon/Bayalbas), Saptari (Rupani), Mahottari (Gaushala), Rautahat (Gaur/Garuda), Bara (Saimara/Kalaiya), Parsa (Birgunj/Jitpur/Nijgadh). Region 3: Kavre (Panchkhal/Bhakunde), Dolakha (Jiri), Nuwakot (Kharanitar), Rasuwa (Dhunche). Region 4: Tanahun (Damauli/Dumre/Anbu Khaireni), Lamjung (Bhorletar/Sundar Bazar), Gorkha, Myagdi (Beni), Parbat (Kusma). Region 5: Banke (Nepalgunj/Kohalpur), Bardiya (Gulariya), Dang (Lamahi), Gulmi (Tamghas), Arghakhanchi (Sandhikharka), Palpa (Rampur), Nawalparasi (Chormara/Arunkhola), Kapilvastu (Krishnagar/Jeetpur/Chandrauta), Rupandehi (Manigram). Region 6: Dailekh, Jajarkot, Salyan, Pyuthan. Region 7: Bhajhang, Achham, Doti (Dipayal), Kailali (Tikapur/Sukhad), Kanchanpur (Jhallari).